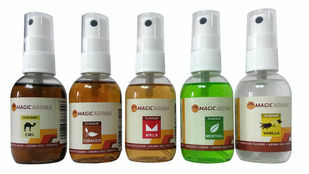 Magic Aroma is a product that gives your tobacco a completely new flavor.Even if you use a small amount, you will be much more satisfied with your self-made tobacco mix.A convenient bottle with an atomizer makes it easy to properly distribute the aroma across your tobacco strips.The aroma contains glycol which guarantees the right amount of moisture in the product.Magic Aroma is so efficient and easy to use that it will become an integral part of your home tobacco kit. 1 bottle of Magic Aroma should last for about 8 kilograms (17.6 lbs) of tobacco. If you use tobacco leaves, cut them first. Before using Magic Aroma for the first time, you should test it on a small portion of tobacco. Check if tobacco is not too moist after 24 hours. If too much aroma has been used, your tobacco may need additional drying.